Sometimes we all go through storms in our lives and it is difficult to know how to get through the storm. That is unless you have Jesus as the anchor of your life. I have a tough month ahead of me and I am trusting In the Lord Jesus to bring me through this hard time. He is in my boat resting so I know that I am not going to crash on the rocks. No matter what kind of crisis or tragedy you are facing, don’t lose hope. Jesus told His disciples in the boat, "Boys, have you not learned anything here?" After all, what did Jesus say to them? He said, "Let's cross over to the other side!" 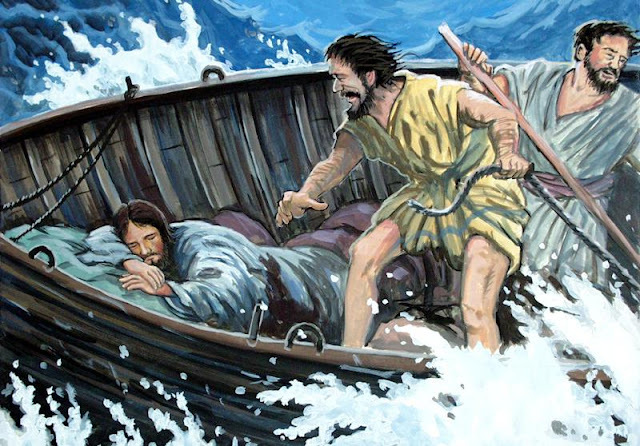 He did not say, "Let's go to the middle of the Sea of Galilee and drown together!" If He had said that, they might have been justified in their collective panic. Jesus never promised a rose garden or sunshine and lollipops as a Christian in a fallen world. He never promised us smooth sailing, but He did promise us safe passage. I would rather be in a storm with Jesus than anywhere else without Him. So, if you are in a storm of life, my advice to you is to remember that Jesus will "get you to the other side." Trust Him. He will not abandon you or let you down. You have His Word on it. For He Himself has said, "I will never leave you nor forsake you" (Hebrews 13:5). You can take His Words and stand on them for they are a solid foundation. Trust in Him and refuse to worry for He is our strength and our song. He is the lover of our soul forever and always. I hope you have a Simply Heavenly Day…. God bless you!! !